Spontaneous fermentation is carried out without the controlled addition of yeast to the wort. It happens naturally, thanks to the micro-organisms in the air. This exceptional brewing method, which is the oldest in the world, has been developed in our region from time immemorial. This natural technique requires patience and a unique know-how that we have mastered at the brewery here for almost 200 years. Lambic with the addition of raspberry (framboise), peach (pêche), blackcurrant (cassis), grape (druif), or strawberry (aardbei), as either whole fruit or syrup. Other, rarer fruit lambic flavorings include apple (pomme), banana (banane), pineapple (ananas), apricot (abricot), plum (prune), cloudberry (plaquebière), lemon (citron), and blueberry (myrtille). Fruit lambics are usually bottled with secondary fermentation. Although fruit lambics are among the most famous Belgian fruit beers, the use of names such as kriek, framboise or frambozen, cassis, etc. More than 35 years ago, Lindemans reinvented Beer Kriek. It was a smash hit! In 1985, Michael Jackson (the most famous beer expert of our time) proclaimed Kriek Lindemans one of the five best beers of the world. 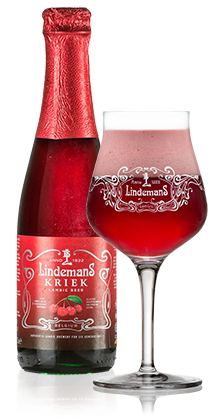 Like other Lindemans beers, this filtered beer kriek is made from a lambic base. The difference, however, lies in the maceration of 25% filtrate of fresh sour cherries before the beer is filtered and pasteurised. TASTE: Deliciously fruity with the fresh flavour of freshly picked cherries. Its sharp and full-bodied flavour gives way to a perfect balance between sweet and sour. Due to the use of filtrate and pasteurization, this Kriek beer is sweeter and fruitier than Old Kriek Cuvée René, which undergoes a second fermentation process in the bottle. Thanks to its innovative flavour, it was a resounding success both here in Belgium as well as around the world. Nowadays, it is undoubtedly the reference Kriek beer for consumers. For more information’s please contact us. If you want you can always visit our catalogue online and check all the beers available for export. Cheers with a Lambic beer Kriek.